This Momma also whipped up a Christmas stalking for our little girl. My husband and I sat on the couch last night looking at our line-up. All that came from our mouths was “wow, we’re a large family!” “We’re so blessed.” ; ) What do you think? Isn’t that line up just beautiful?! On a quick side note: We debated on sharing our youngest daughters picture here on the blog without her having a proper introduction. But, we felt that seeing her sweet face helps those of you praying to visually see who you are praying for. So, that proper introduction will come – once she’s in our arms. <3 But in the mean time – enjoy her adorable face. : ) Don’t you just want to pinch those cheeks?! 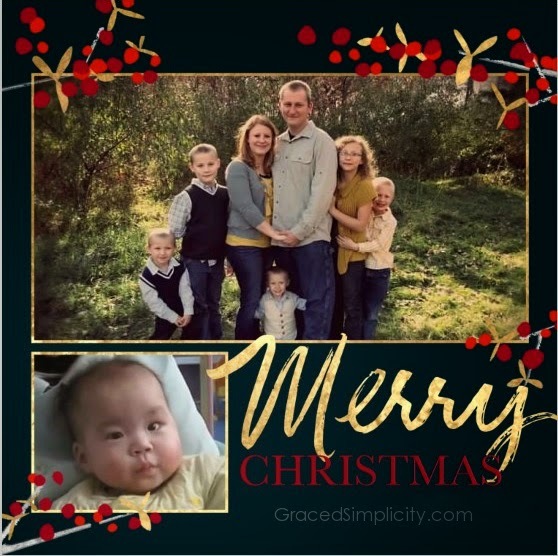 Merry Christmas & Happy New Year – from my family to yours! P.S. There will be no Hearts for Home weekly link-up this week due to it being on Christmas day – however you may join us for a new years day, as the link-up will be open! Come, mingle, encourage & share! See you then – Lord willing!